Hello one and all! I recently signed up for the Spellbinders die club of the month. I have seen lots of beautiful examples from past months online and this was the month I finally signed up! I have had the dies laying on my desk just waiting for me to play with them. We won't talk about how large my new supply stack is...or the fact that I should be getting my Lawn Fawn pre-ordered goodies any day. Sigh. Not enough time for my crafting. Back to it. I had absolutely no plan in mind when I started this card. 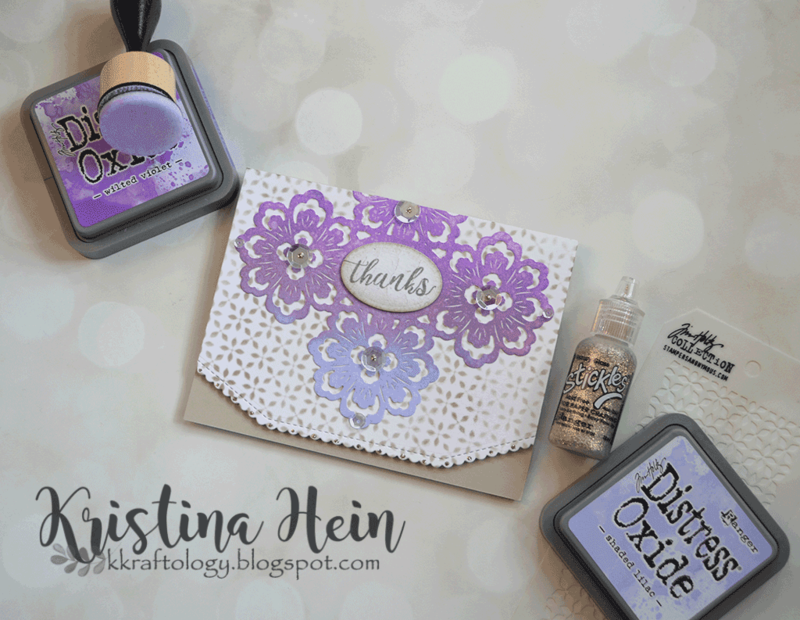 I had a purple Distress Oxide ink combo I wanted to use and the die. I cut the die out of Bristol paper so I could make the oxide inks blend like butter. I literally just kept playing around and building a card as I went! I'll show you the picture and then give a few details. And a closer card shot. I cut the die from Bristol paper. Then I blended Shaded Lilac, Wilted Violet and Dusty Concord oxide inks on until I was happy with the blend. I sprinkled it lightly with water and blotted dry. Then I sprayed with a shimmer mist and blotted again. I set the die cut piece aside to dry. For the backrgound I used a Tim Holtz/Stampers Anonymous mini stencil. I don't have the name for this one but I think it came in a multi pack from last winter's release. I used Pumice Stone in regular distress ink to sponge on the design. I cut the edge of the panel with a die from MFT Stamps. I adhered this panel with foam tape to a Sahara Sand (Stampin up!) card base. I adhered the die cut piece directly to the stenciled piece. I used the oval die that came with the large die to cut out a white piece. 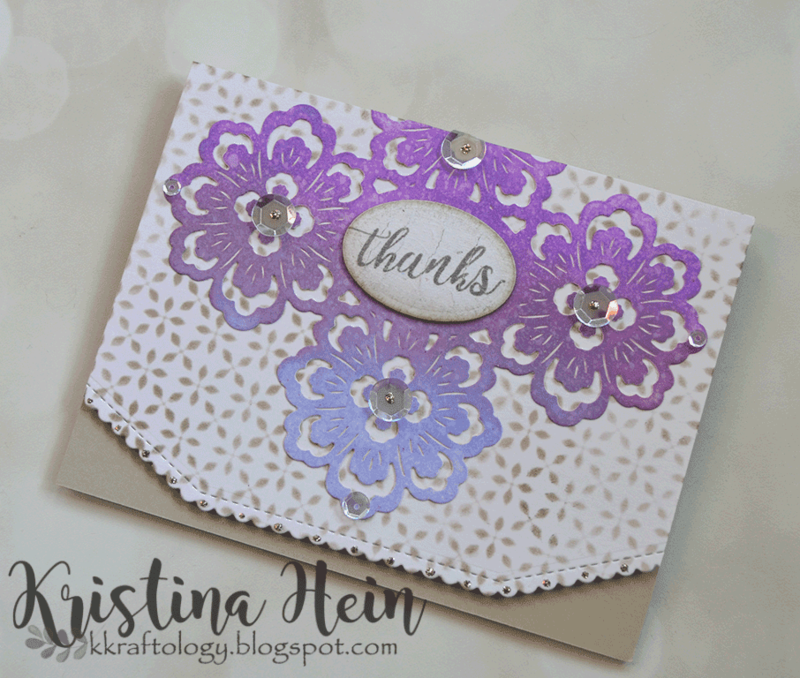 I used the Thanks sentiment from an Altenew set called Enchanted Iris. The ink is Sahara Sand. I did sponge the edges of the oval a bit before using foam tape to adhere it to the die cut piece. I then added sparkling clear sequins from Pretty Pink Posh. For the final extra detail, I added a little dot of Mercury Glass Stickles to every other scallop. Done! I love how this came together even though I didn't have a plan.